You are a team of adventurers – trapped in a cursed temple. Together you must activate the magic gems in the temple chambers in order to banish the curse. Look out for one another. Some tasks can be accomplished only as a team – and you have only 10 minutes before the temple collapses! 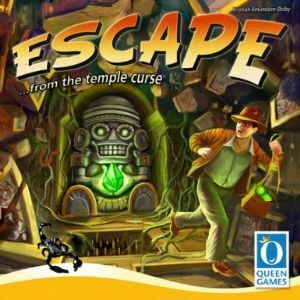 Escape is a cooperative real-time game, that is not played in rounds. Instead, each player rolls as quickly and as often as he can with his five dice. The dice determine your fate. Discover the different temple chambers by rolling the correct dice combinations. Take care, if you fall under the spell of the Black Mask, you‘ll need the help of the Golden Mask and your team-mates in order to keep moving! Two modules make Escape even more exciting. Curses and Treasures make gameplay even more varied. The treasures aid you whereas the curses make escape more difficult. Everything you need and more for Escape, including all the expansions and a few promos to boot! It's time to get out of dodge, you have 15 minutes on a soundtrack in which to Escape otherwise you will become Zombie lunch! What a laugh. 4 stars for this simple dice rolling game. Its manic and fun but should only be used in small doses, as a filler or starter game Good points. MANIC FUN. Production quality is amazing. Plays in 10 mins Bad points. There is nothing bad about it but its superficial and replay value on the night will be a couple of games -its a good starting game -it gets everyone warmed up!